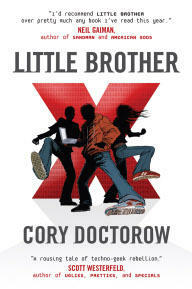 My best read of 2008 was Little Brother by Cory Doctorow, sci-fi writer, co-editor of Boing Boing and general good guy. San Francisco is hit by a major terrorist attack and the US Department of Homeland Security goes bezerk. In the war on terror all basic human rights are hung out to dry and no one is safe (sound familiar?). The story’s protagonist, seventeen-year-old Marcus, aka “w1n5t0n,” is not going to take it lying down and unwittingly leads a techno-geek rebellion against this injustice (thanks Scott Westerfeld for this description). The novel is action-packed with teenage passion and righteous nerdism and, as Jane McGonical points out, holds “a bold argument: hackers and gamers might just be our country’s best hope for the future.” Alternate reality gaming — which is my “hot thing” for 2009 — is also covered, albeit obliquely, in the book. The New York Times listed Little Brother as one of the eight notable children’s books of 2008, but don’t be fooled; it’s totally cool for adults too.